Ecologists now recognize that controversy over the relative importance of niches and neutrality cannot be resolved by analyzing species abundance patterns. Here, we use classical coexistence theory to reframe the debate in terms of stabilizing mechanisms (niches) and fitness equivalence (neutrality). The neutral model is a special case where stabilizing mechanisms are absent and species have equivalent fitness. 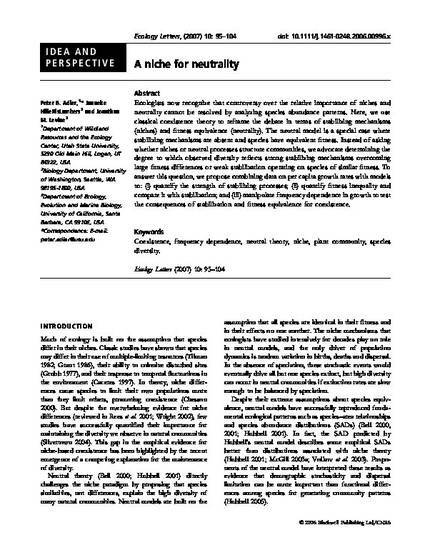 Instead of asking whether niches or neutral processes structure communities, we advocate determining the degree to which observed diversity reflects strong stabilizing mechanisms overcoming large fitness differences or weak stabilization operating on species of similar fitness. To answer this question, we propose combining data on per capita growth rates with models to: (i) quantify the strength of stabilizing processes; (ii) quantify fitness inequality and compare it with stabilization; and (iii) manipulate frequency dependence in growth to test the consequences of stabilization and fitness equivalence for coexistence.